American Diabetes Association, 9781580405423, 581pp. The average American will eat out at a restaurant five times this week, and while there are healthy choices available at restaurants, it's not always clear what they are. Fortunately, Hope S. Warshaw has created the ultimate guide to eating healthy--and eating well--in restaurants for people with diabetes, prediabetes, heart health, or those just looking to lose a few pounds. 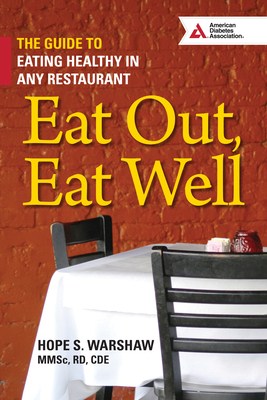 In Eat Out, Eat Well, Hope has created individual strategy guides for a wide variety of cuisines, ranging from everyday burger shops to ethnic choices. Each style of restaurant includes healthy meal options, which recommend certain dishes and portion sizes. There's information on what to avoid and how to go about the making special requests. Each restaurant style also includes nutrient counts to help identify healthy choices. For anyone trying to manage their diabetes but looking to have dinner out, this is an indispensable guide. Hope S. Warshaw, MMSc, RD, CDE, is a nationally recognized and respected expert on health and meal planning with diabetes. She is the author of many books, including Real-Life Guide to Diabetes, Diabetes Meal Planning Made Easy, and many more.